When Joel Embiid visited Los Angeles this week he was well on his way to lead the Sixers to resurgence, but almost no one expected him to be so dominant against both the Lakers and the Clippers. 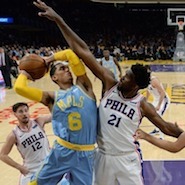 Against the Clippers he had 32 points, 16 rebounds, two assists and one block, while against the Lakers he exploded for 46 points, 15 rebounds, seven assists and a staggering seven blocks as he led the Sixers to two solid victories. The skilled 6’10” Center faced and challenged defenders of every shape and size and found a way to embarrass all them. He made most of his opponents look like college players as he fooled them with fakes, eluded them using great first steps and overpowered with impressive finishes as he attacked the basket with determination (Laker fans can only hope Lonzo Ball took notes). What makes him so hard to deal with is that he has a very good jump shot which he triggers by facing defenders, threatening to drive to the basket and then rise with a very small jump to drop the shot in. But when he’s not in position to get good shot off he has the physique to bully and outmuscle defenders on his way to the rim for an easy basket. But the thing that separates him from other big men in the NBA is his talent to shoot from the three-point line (33 percent, which happens to be better than Lonzo’s numbers). He’s proven that when defenses limit the Sixers options inside the paint or near the top of the key he can just launch the ball from way downtown for a three-point basket. The most encouraging thing for the Sixers and their fans is the chemistry he’s developing with point guard Ben Simmons, which only serves to make the rest of the NBA very weary of playing them. The chemistry of Embiid and Simmons is from out of this world as they both move so well without the ball and are aware of where the other is on the court, which often helps them execute great passing plays between them. Any Embiid-Simmons pick and roll plays are likely to end in a good shot and they can execute them from anywhere in the court. He owns superb passing skills because with his height he can see the whole floor easily to decide where to send the ball and with his reach he can go around most defenders. Defensively he has great rim-protecting skills, incredible lateral quickness and great instincts to help his teammates when they get beat. With two players that are so talented and make their teammates insanely better the Sixers will undoubtedly continue to improve this season and should be a playoff team for years to come.